The Toy Fox Terrier is a lively, affectionate, playful, protective, determined and devoted companion. He is fiercely loyal to his family, and loves and needs to be with you. He is a very active and energetic dog who also loves to cuddle in your lap, watch television, or lounge around with you in the sun. He is generally friendly with people, although he may be suspicious with strangers at first. An outstanding watchdog, he is intensely protective of his owners and not easily intimidated. He has excellent hearing and will bark to alert you to unusual sounds. Yet at the same time he is not a yappy dog, and doesn't bark simply out of habit. He is easily trained, sensitive and eager to please you; he quickly learns new commands and tasks. He can learn certain words, and also be taught to recognize sounds and devices--one reason he is often used as a service dog for people with hearing disabilities. He can sometimes be a bit stubborn and independent, but is usually ready, spunky, active and quick. He is playful, clownish, fun-loving and tireless. He seems to have the energy of a puppy all his life! He loves balls and games of fetch, and can be quite active indoors as well as outside. He likes a daily walk and regular chances to run free in a safely enclosed area. When outdoors, he should always be on a leash or behind a secure fence, as he will chase and run away after birds and small animals. He can get along well with other dogs but is unreliable around small pets and cats. He is too fragile for very young children, and does better with older, responsible children. He can be difficult to housebreak. He is a wonderful hunter of "critters" and will keep your house and yard free of mice. He dislikes cold weather, and should be protected with a sweater when outdoors during winter months. He is a very clean and odorless dog, but he is a moderate shedder, and so might not be a good pet if you are concerned about dog hair in the home. 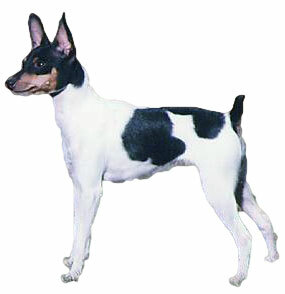 The Toy Fox Terrier is 8 to 12 inches tall (to shoulders) and weighs 3 to 7 pounds. He has a short, fine, shiny coat. His coat color is white with black, tan, or chocolate. His coat only needs to be brushed occasionally, or more often to reduce shedding. The Toy Fox Terrier is an American breed of dog developed in the 1930's as a cross between, variously, Fox Terriers, Manchester Terriers, Miniature Pinschers, Italian Greyhounds, and Chihuahuas. He is also known as the American Toy Terrier or the "TFT.". He was first recognized by the United Kennel Club (England) in 1936, and was admitted to the AKC in 2000. His AKC popularity was 88th out of 157 breeds in 2007.